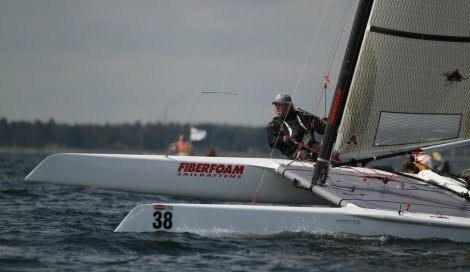 I asked Landy about some gps speed differences and passes I saw at the Worlds at Aarhus and also for some feedback on the Scheurer, as I'm gathering info for a future possible launch of the A local class. Arno will be sending some feedback from Stevie on his title on the dna, and I've sent a full interview to Nils Bunkenburg over his 2001 designed weapon, the Nikita. Andrew Landenberger: "I expect you would have seen some funny things happening on the tracker. The wind was very gusty with large directional changes, which were basically impossible to depend when they came. In fact defending in this regatta often lead to disaster so you basically needed to be aggressive and attack all the time. At this moment I believe there are three top level boats on the market. The DNA, the Nikita and the Scheurer. 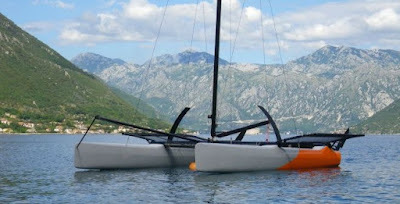 While the Nikita takes some time to get the DNA guys are doing a great job to put sailors on boats and build the fleet. The Scheurer factory has basically had a season off due to building a new modern factory, but they will be back in force next season as well. I was very happy with the Scheurer. 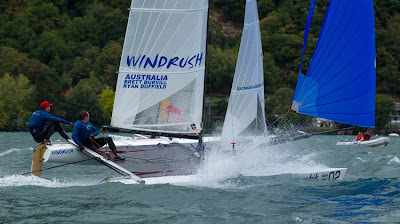 I think it was fair to say that I along with Brad Collett we were clearly the fastest downwind. 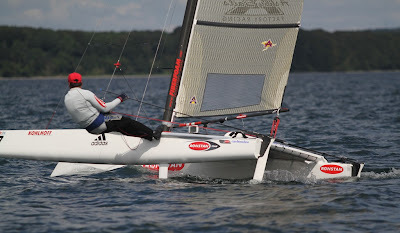 I chose to sail the Scheurer because I knew how fast this boat is downhill. I can stand in trapeze and push it much harder than the other boats. 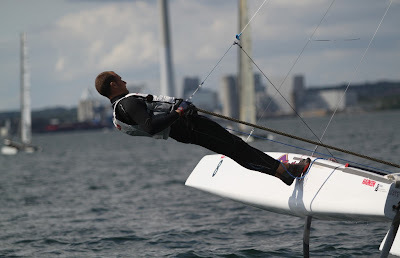 I basically sailed most of the regatta trapezing down wind. even in very moderate wind I am now always on the trapeze. You would have seen on the tracker some dramatic speed differences and that was simply because I was on the wire while the others were still sitting on the trampoline. The G6 is not actually a low volume boat. It sits basically right in the middle between the Nikita and the DNA. Over the past year Andy Scheurer has built me several proto types for testing. It has been an interesting period of experimentation. After all the testing we have arrived at a point where Andy Scheurer is ready to build the G7. There will only be small but significant changes. The existing boat is already very fast but the G7 will incorporate a change in beam position and centerboard position as well some modifications to the volume distribution in the hull and the rocker line. The G7 will also feature rails to maximize righting moment from the trapeze. The boat is also now built from Nomex and is an extremely stiff platform. 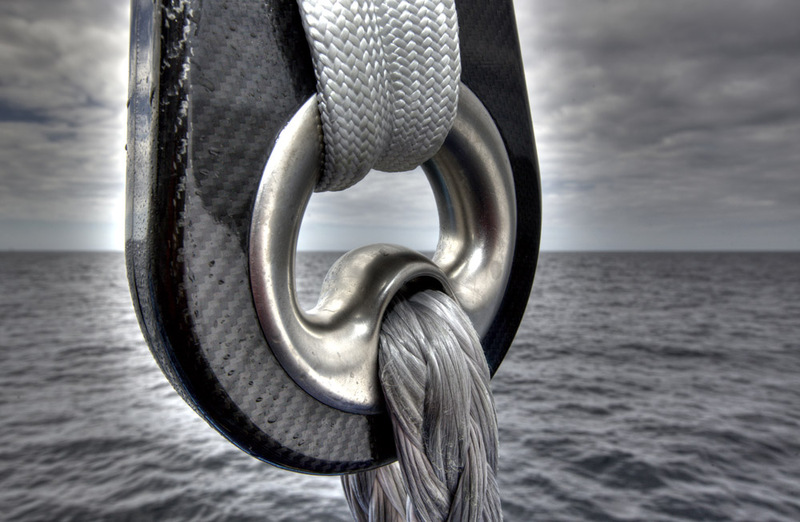 In all it is a very high quality product which will equal any boat on the market. 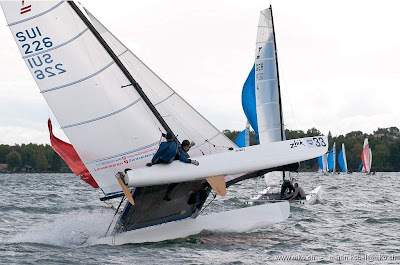 If you want to sail in waves and steep chop this boat just loves it. Brad sails from Humpybong in Queensland which is one of the roughest pieces of sailing water we have on the east coast. 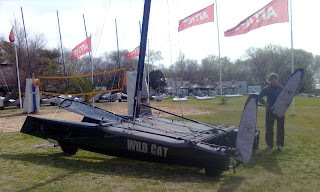 He has tried other boats but maintains the Scheurer is the only one he can really drive when the water turn unfriendly"
Last ride on the only Wildcat available in Arg was some months ago crewing in pratice races, and some few minutes helming. The Blackie changed hands a few days ago to the new Hobie local dealer, Esteban Blando, a Tornado Sailor 'forced' to join the F18 and now enjoying the game finally, with the boat he always wanted. More Brand new Wcats are arriving soon. Photo: El Águila - The NED 007 Black beast. 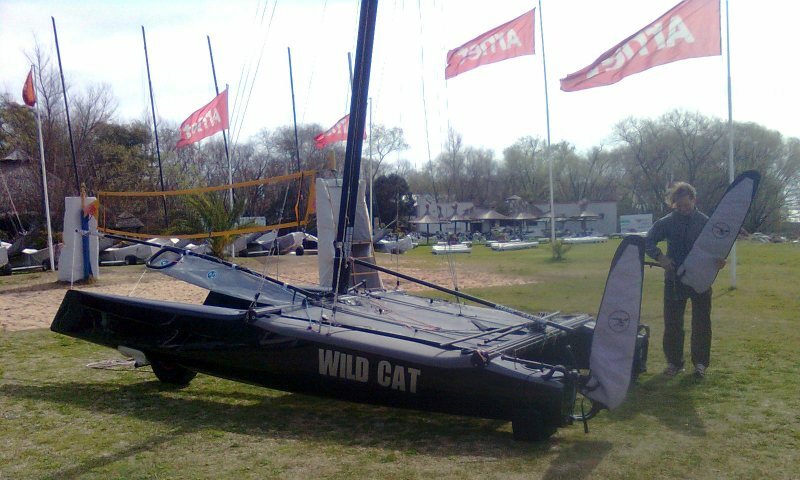 But this Wildcat is special, as belonged to Mischa and Bastian in 2010. On Friday we have a training session on excellent conditions with 14-15knots with some waves, I was impressed by the helm response, upwind and with Spi. After 3 good hours of sailing the new owner sailing it for the first time, had a huge grin on his face. 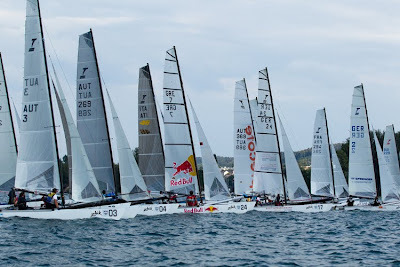 On Saturday we had a long distance race organize by the local catamaran club, El Águila, that is gathering the 90% of the fleet right now, with a few initial winward-leeward legs, nice format. I was helming all the way, we started too close to the rib but managed to avoid it and start clear. Perfect flat 10 knots double trapeze conditions and the Wildcat started searching for her 'sweet spot', a certain trim/speed where the boat starts to fly at constant speed but gaining angle at each second, the feeling is no drag at all, as I posted before, like snowboarding on powder, that is the exact feeling for it. Already reported here, but this time as I helmed the whole race I could notice the incredible precision of the rudders, control and a smooth feeling to the max. One of my best sailing sessions ever due to the conditions and the boat, I was literally using my finger tips to drive it. Still the final test missing, +20knots Sudeste and high chop. 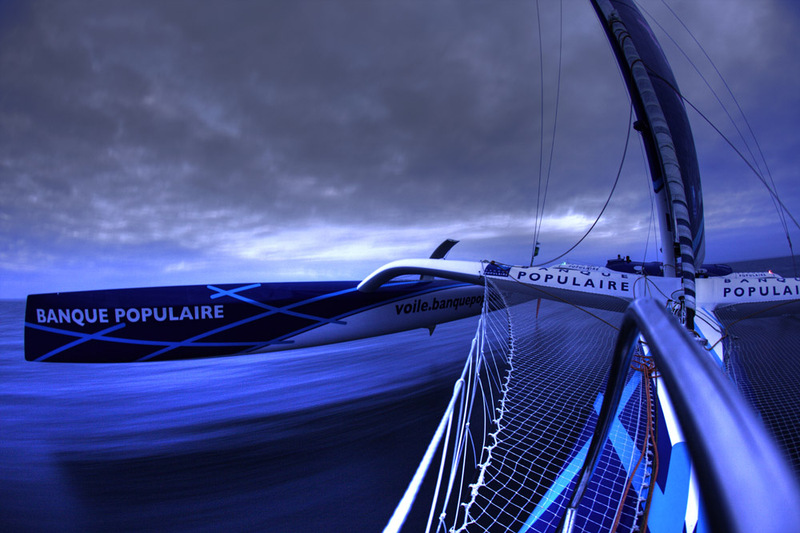 After some good runs with the lead pack, leading for moments on the initial windward legs, we ended 4th close to the top two MKII and a C2, the best 3 crews, full trained with European and US seasons on them, and I was sailing the boat for the first time, with Esteban too. Last test the Wildcat was on longboards agains Inf v1s, now although we raced with the standard wcat boards, all brands have updated their designs and Sergio's C2 and the Inf mkii were with longboards and new sail plans, so is nice to have a growing local fleet with all brands available. The best thing about the F18, A-Class and other formulas is having the opportunity to chose the boat that best suits you. The difference in performance is marginal and depends on the conditions, and after two hours of racing with some lulls mixed with the excellent conditions 3 diff brands ended too close, and the gains were done by the crews. 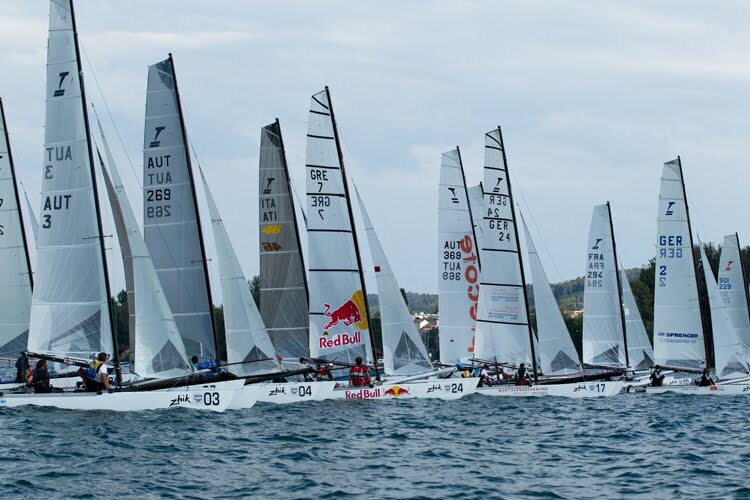 The regatta was won in great form by Juan Faustín-Lucas Gonzalez Smith, beating the 'Euro power crew' of Cruz Gonzalez Smith- Mariano Heuser (15th at Balaton) , 3rd some 20 meters ahead of us Sergio Mehl-Nico Aragones, we were 4th with Esteban, 12 boats racing. Next drving test should be new Ian's C2. He raced quite well for his first time but ended trapped on a no wind zone on an extended lull that last 30 minutes. Also next week we'll have the first official regatta of the 2011-2012 season. 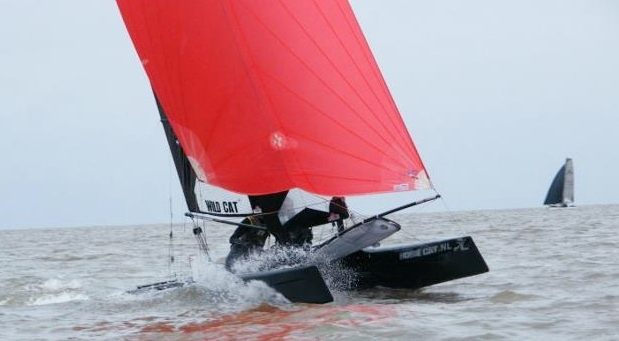 Esteban and one his 'babies' ( He also has the best local Tornado... don´t you ever think of touching his boats without permission....jeje) will be training hard for the 1st South Americans and 4th Arg Nats, another Wildcat coming and I think we'll have some more in the future. Not much info or pics at the Italian F18 Class or at Dervio website. Vicenzo Sorrentino and Giorgio Colombo on a Mattia F18 are the new Italian F18 Champions. 55 boats with Heemskerk-Tentij 3rd and the Italian champs and 3rd at Balaton, Bissaro-Cesari 7th. 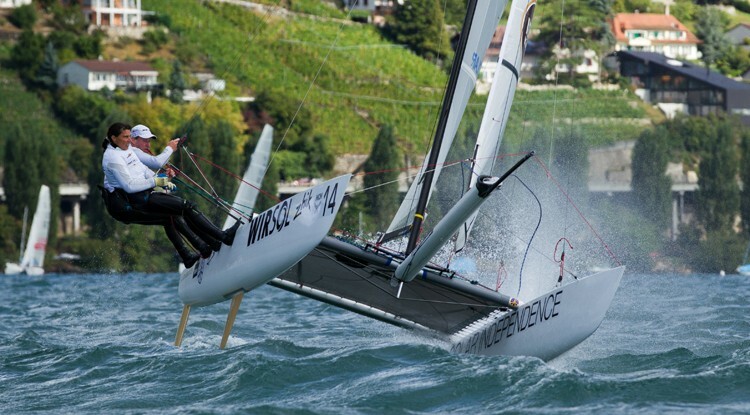 A demanding final day on Lake Biel. 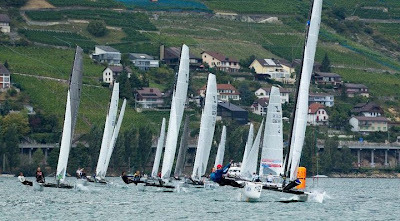 On the last and decisive day of the Tornado World Championships on Lake Biel, the wind gave the 37 Tornados reported from eleven nations, a extravagant, yet challenging final. The anticipated cold front brought fresh westerly wind of four to six Beaufort. Shortly after ten clock, there was no holding back on the start line. Two false starts were the result. 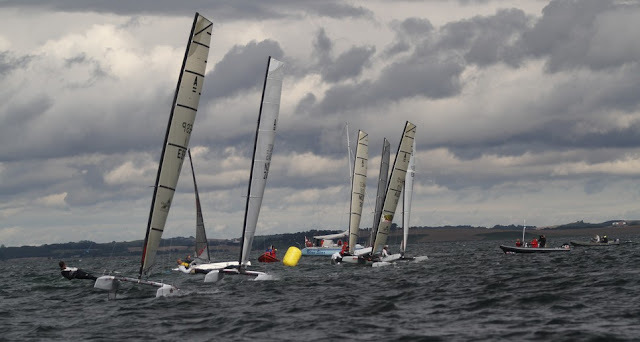 The teams then sailed three races in quick succession. The favourite was impressed by neither wind nor whitecaps and pulled away again. The Australian Brett Burvill Duffield and Ryan (AUS 327) won against the European champions from Greece, Iordanis Paschalidis and Konstantinos Trigonis (GRE 7) and the German reigning World Champion pair of Roland Gaebler and Nahid (GER 1). The field pulled apart, another 18 boats lined up for the third race of the day. The victory came for the Greeks. 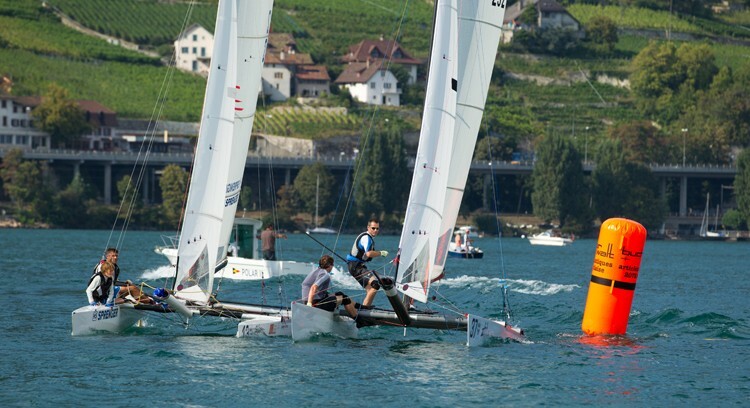 This was the first time in Switzerland for the German team and they had not known what conditions they would have to reckon with. 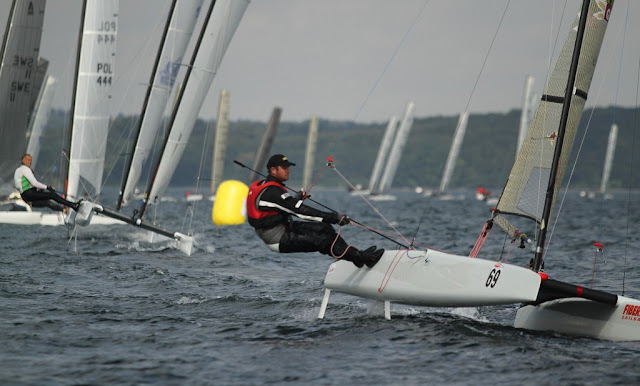 To win the title was, however, their goal, Nahid said, after the regatta. 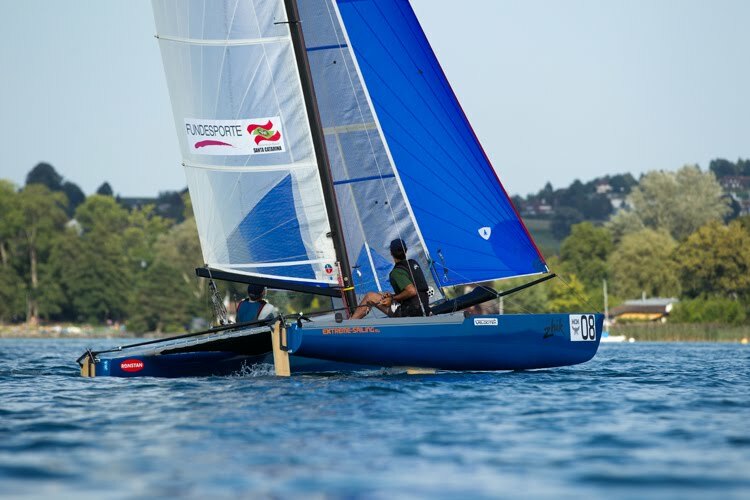 Gaebler was delighted at the title in the mixed category, which they brought against the Austrians Nicole and Dietmar Salzmann (AUT 3) and the Rusterholz paring. 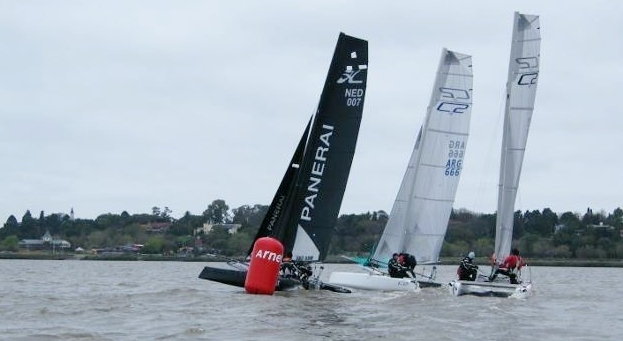 The ten who had traveled as Mixed teams are hoping that the Tornado is in Rio de Janeiro in 2016 as the Mixed Multihull for the Olympics. are waiting to battle it out for this year's Tornado World Championships on Lake Biel in Switzerland this week. Racing was due to start on Wednesday but interesting wind conditions have prevented any races from taking place so far. 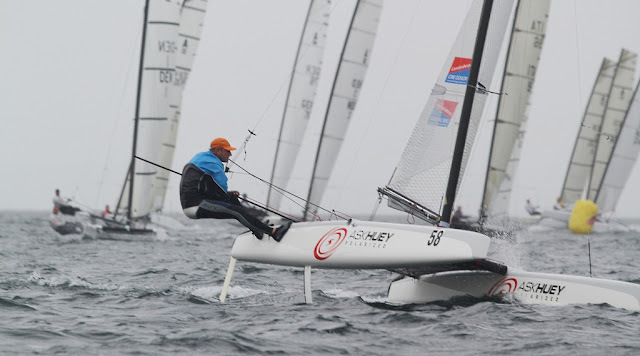 Stormy winds on day one forced the race committee after two attempts to postpone racing. 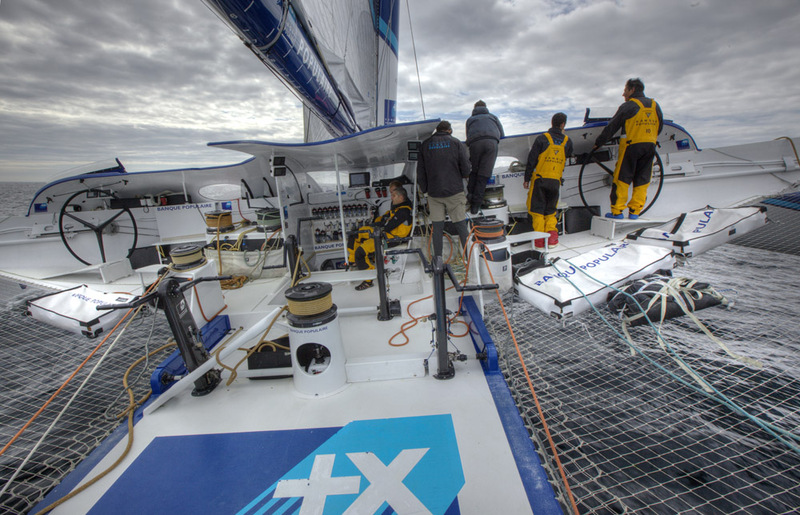 Day two produced the opposite with winds between 2 and 4 knots. The race team have Friday and Saturday to run the championship races; ten races are ideal but at least four are necessary for a valid World Championships. Four of last year's top 5 teams are at this year's event hoping to improve on their results from last year. Current World Champions Roland and Nahid Gaebler are hoping to hold off the Greek team of Iordanis Paschalidis and Konstantin Trigonis who took victory winning all races in the 2010 European Championships. More news to come tomorrow. Photo from 2010 - Jason Waterhouse is my bet for this years Aus Nats, the next Bundock? 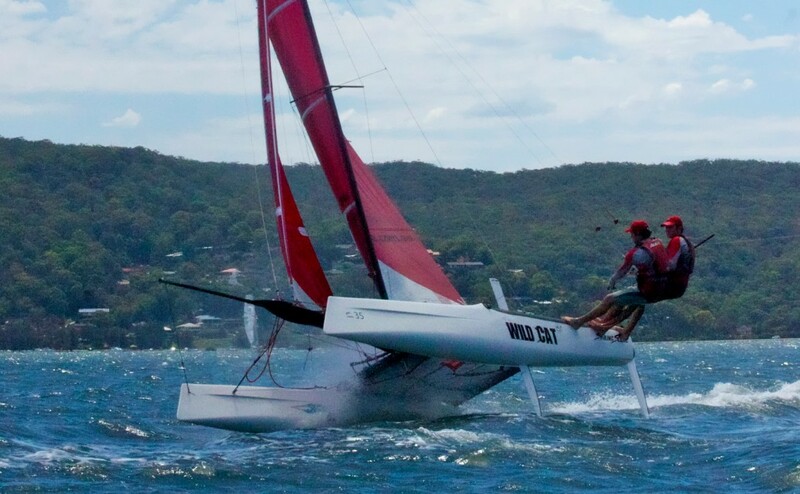 Only 10 days to go before the F18 Nationals at Magnetic Island Race Week. In Townsville today it is 26o and sunny with a fresh afternoon sea breeze. I know where I would rather be. So pack your boat and boardies and head north for some fun in the sun. Barge We have sponsorship for barging our boats onto the island. I have been trying to contact Mick Guinea, as I’m not sure if we have to book a time for the barge trip. The details will follow in the next email. Rigging At this event we will not be rigging on grass or sand. The rigging area is an asphalt car park and boat ramp. You will need foam pads to protect your hulls from damage. F18 Association membership All competitors at the nations need to be financial members of the F18 association. To join or renew membership either go to our website http://www.ausf18.org.au/MEMBERSHIP/MEMBERSHIP.html and download the forms and pay by direct debit or just fill in the forms and pay at the event. We don’t do credit cards. 60 boats already pre registered for the 2011 Formula 18 North Americans at Hyannis, Massachusetts. 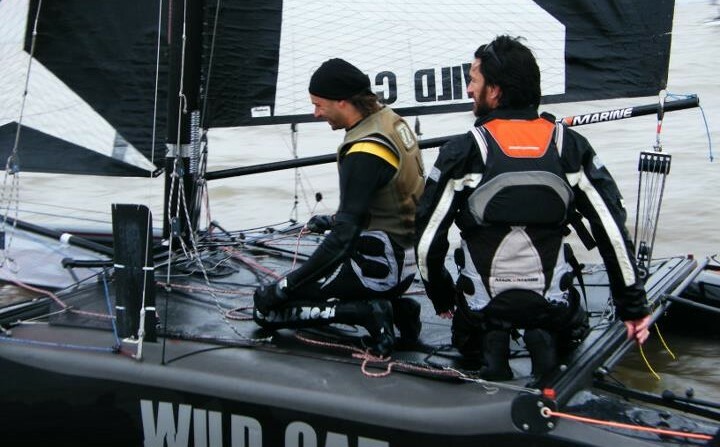 Argentina will be present with one of our best crews, Sergio Mehl and Nicolas Aragones with a C2. These two have won the previous Worlds regattas at home. 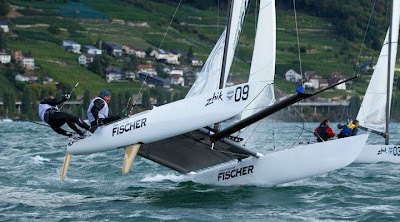 Taking Argie crew work at the 2010 NA (7th) and recent place at Balaton Worlds (15th) of Smith-Heuser, they should be near the top ten, at least is what they are expecting. They could be the 'dark horses' for sure, whatch out for Mehl, when he was full on Formula Windsurfing he won the FW US Open... he had a 'slow' start on the local F18 and end dominating last local events, this guy grabs a new sport and commits, with some good equipment resources and raw talent he always aims high, let see what he and Nico can achieve this time. 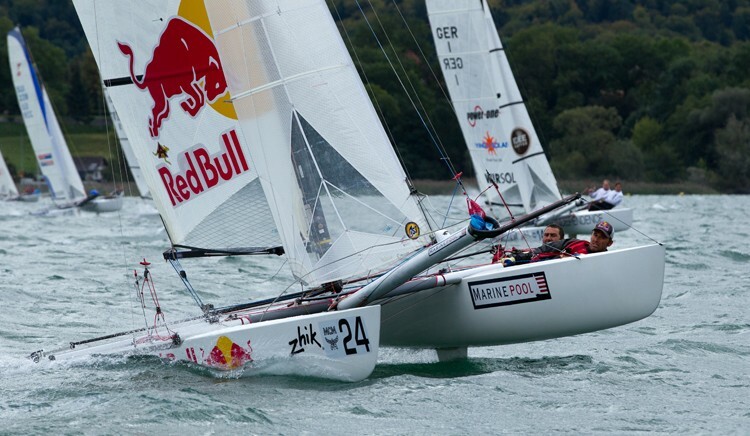 Many US and Canada top guns present, not any European sailor registered yet. US AHPC, Performance Sais and other big names are supporting the event. How come BP is not sponsoring Peyron on the AC? 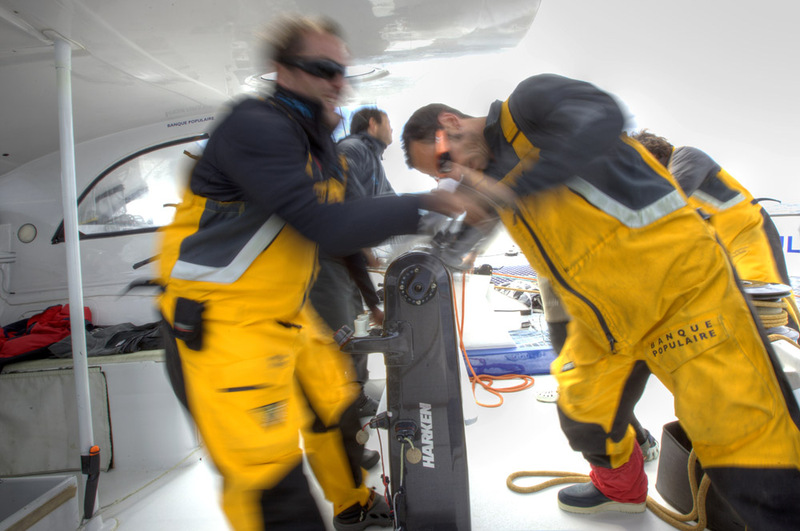 Text by Lia Ditton: "Fastnet Record, BANKED! And the name is Peyron, Loïck Peyron...! 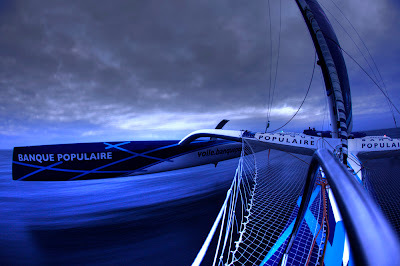 Having covered the 608 nautical mile course from Cowes to Plymouth via Ireland, in a trifle one day 8 hours and 48 minutes, the skipper of the 140ft "géant" did a swift about turn; picked up photographer Christophe Launay and headed off back to home port, Lorient. 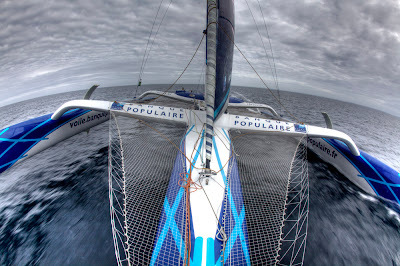 Enroute, the Banq' Pop' monster cruised past the Figaro soloists, including BP's little sister, sailed by Jeanne Grégoire. "Good luck Jeanne!" the crew encouraged. Breeze on and it was all action stations, "man your handles" as the BP5 Space Craft turned BP Gym! 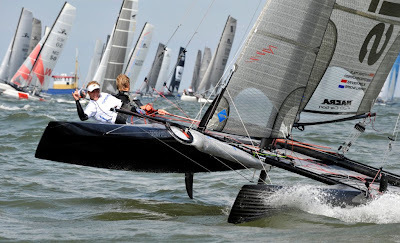 Zandvoort, Over the weekend of 20 & 21 of August the NAM REM RACE was sailed. This weekend consists traditionally out of one day long distance racing + one day of Olympic course racing. The weather forecast looked promising and indeed this weekend proved to be an excellent sailing weekend. 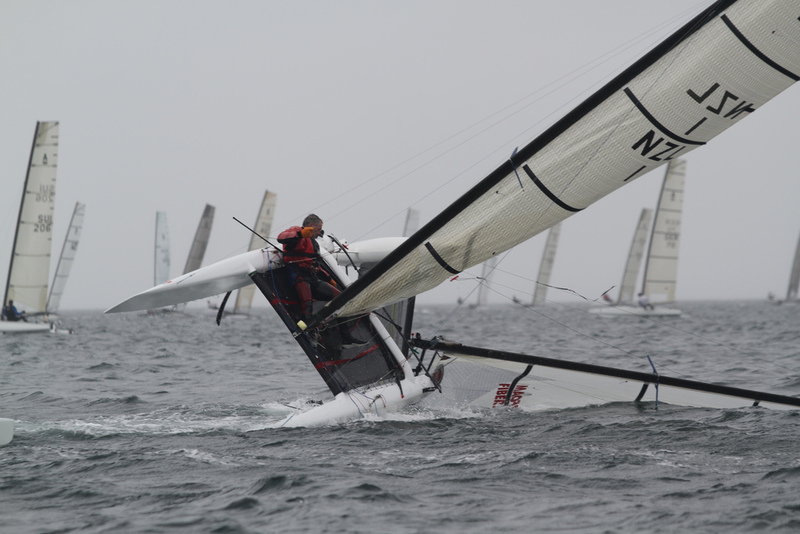 On Saturday during the long distance race at the start it was blowing 18/20 knts and slowly decreasing over the day. A beautiful upwind leg brought the fleet from Zandvoort to Noordwijk/Katwijk to go around some course marks. After Katwijk the heading became the NAM buoy which is located 90 degrees offshore approx. 10 miles at sea. From that mark heading back straight to Noordwijk and back to Zandvoort. 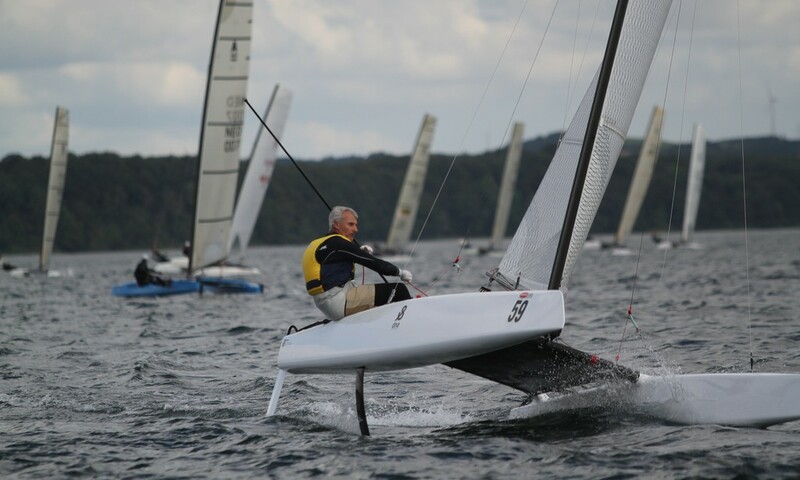 After 2 hours and 29 minutes 29 seconds it was Peter Vink with Gerhard van Geest with their NACRA F20 Carbon that finished first. Followed by the brothers Boers, also sailing on a NACRA F20 Carbon 2 hours 29 minutes and 54 seconds. 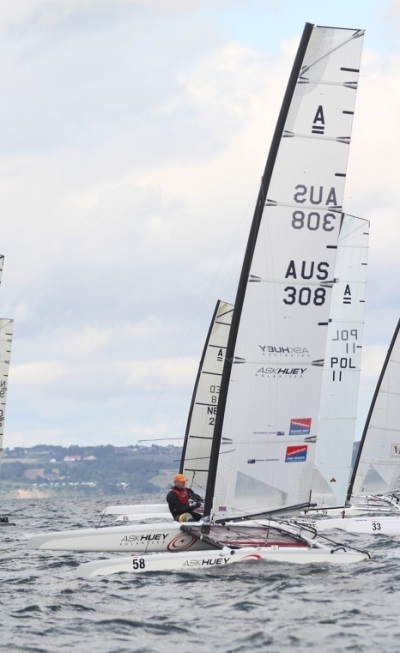 Third over the line were Gunnar Larsen & Sam Frank with again, a NACRA F20 Carbon in a time of 2 hours 32 minutes and 54 seconds. 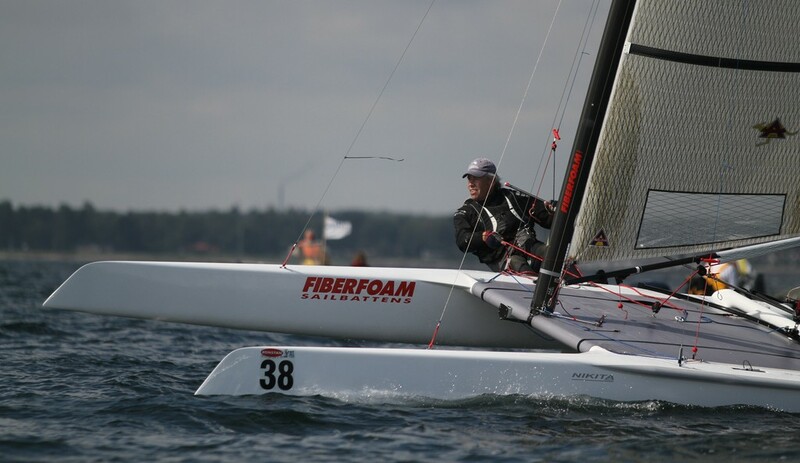 The first F18 and coming in fourth over the line where Coen de Koning & Thijs Visser with their NACRA F18 Infusion 22 minutes after the first finisher. M32 being tested with German and Italian teams. 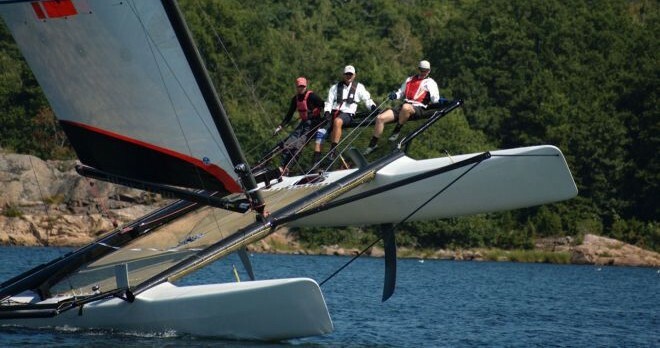 Marstrom team is going to Garda end August for promotion and Centomiglia / Multicento race in beginning September. Photo: Kristoffer West / Sailing Aarhus - Steve Brewin, impressive title coming from behind on his Dna. 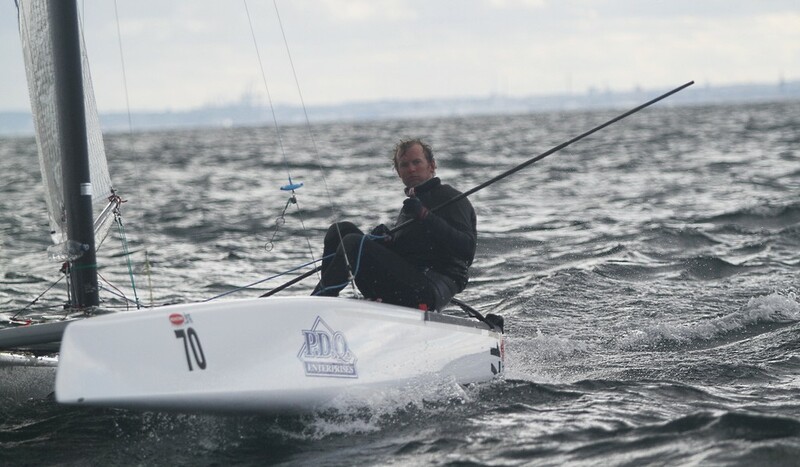 Photo: Kristoffer West / Sailing Aarhus - Scott Anderson on a Nikita, finally 2nd, he was the most consistent sailor the whole week, a capsize on 9th and last race ended his wc aspirations, +50 years old and still performing at the highest level. Photo: Kristoffer West / Sailing Aarhus - Jack Benson 3rd, dna. 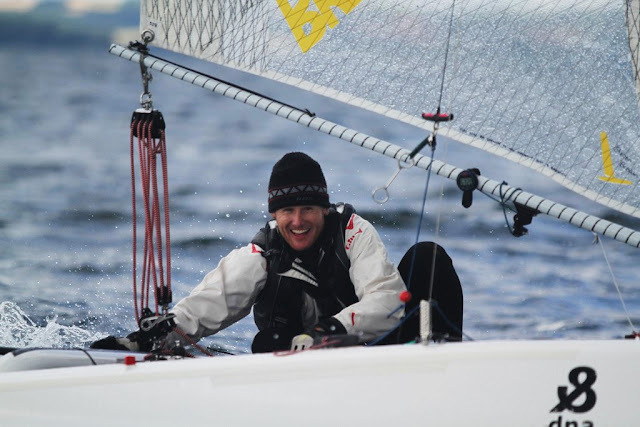 Photo: Kristoffer West / Sailing Aarhus - Andrew Landenberger 4th, Scheurer. 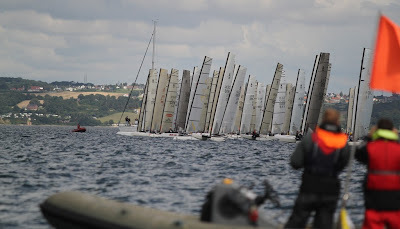 All Photos: Kristoffer West / Sailing Aarhus - I Don't have much knowledge on the history of the A-Class, but this could easily be on of their greatest events ever. Title decided on the last race with Scott Anderson leading by 2 points, he needed a 2nd for securing the title beyond Brewin winning the last race. Anderson led all week with comfort until yesterday Brewin won 2 races, and today a bullet on the 8th . After the 8th race the organizers decided to postpone the last one, they had until 4pm to launch the 9th, with Anderson being virtual champ. The winds came up to +20knots and at 15,05 the RC started the alst race of the event. Brewin with a controlled 2nd behind future World Champ, Jack Benson. Anderson was on the top ten but suffered a pitchpole ending any possibility for him. This is one of those events when you need to declare a tie! but Steve Brewin "stood up and deliver" as he said today, a deserved title for the A-Class warrior. Impressive Win under pressure for Steve Brewin and hat off to Scott Anderson, when 50 I want to be riding an A like him. Mischa Heemskerk ended with a double 3rd for a 12th overall... next year top 5 for sure. No A-Class here in Arg yet, but as I wrote several times, it will be the next big project. 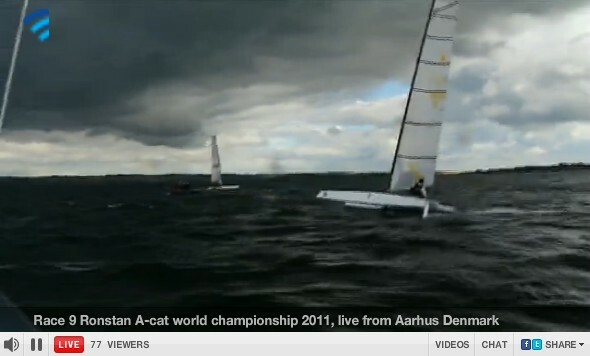 Live Feed by streamfactory.dk- Steve flying downwind for the title on the final race.This was the best broadcasted World Championship coverage that I remember. 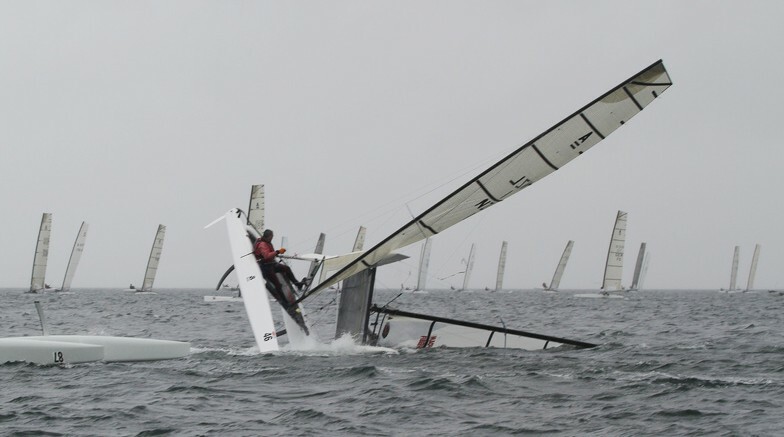 You can´t ask for more, the last race was followed with a rib close to the action, see image above. 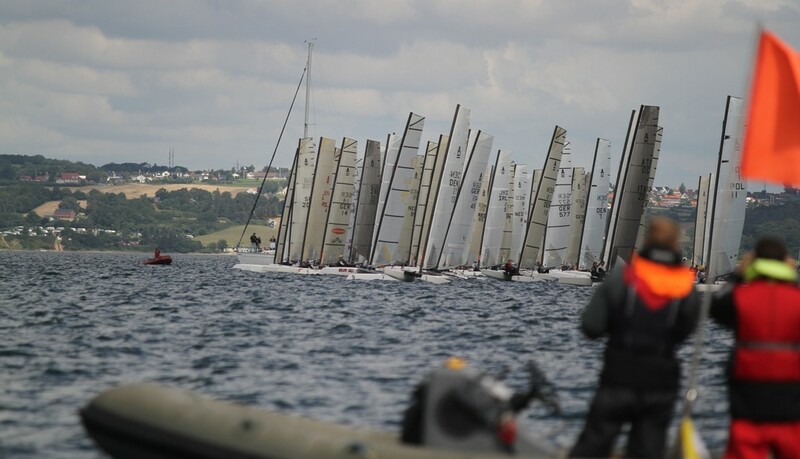 Again, congrats to Sailing Aarhus and the Class, www.a-cat.org for delivering the goods to promote such an event. 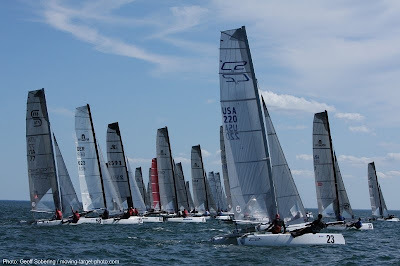 Only one race today, as wind was too unstable, several gral recalls and black flags. Ben Moon took the worst part with a bfd, unlucky move as he was racing super consistent. European Champion, Bob Baier with a Nikita on a comeback with a 2nd today behind Steve Brewin (dna). Chances for the title are within Anderson and Brewin reach, maybe some match racing from Scott to block Steve , on ly 4 points behind. 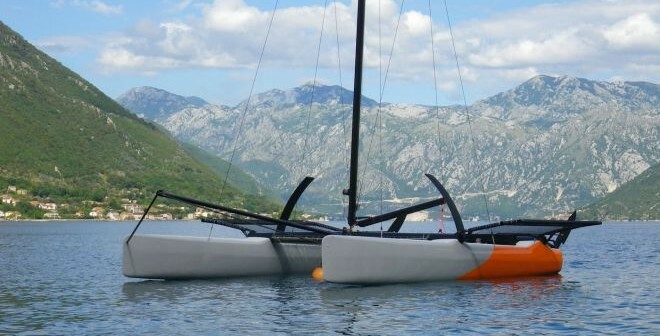 Something is 100%, we will have a new World Champ to replace Glenn Ashby as the nr 1 solo cata racer in the most advanced and lightweight of the multihull classes.